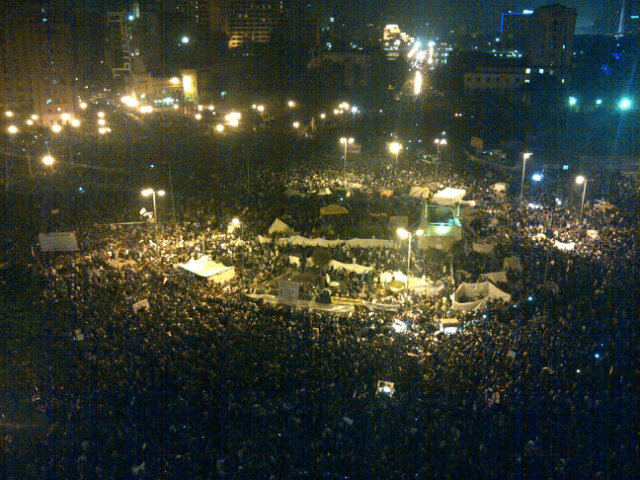 At least 100,000 people are in Tahrir now. People report a jubilant mood, but there seem to be a lot of clashes between demonstrators and Central Security police east of the Square, around the American University of Cairo and Midan Falaki. @IaninEgypt: “Mohamed Mahmoud street looks apocalyptic. There are fires everywhere, sirens, smashing glass and gun shots.” My friend @LiamStack of the New York Times says that the Bab el-Louk souk, the old covered food market in Falaki across from the fabled Cafe Horeya, was set afire by tear gas canisters and has been burning. In Suez, cradle of the Revolution, Al-Ahram reports swelling demonstrations in Arbaeen Square. The April 6 Youth Movement also says there are protests in a growing number of cities around the country, including ,Beni-Soueif, Al-Sharqiya, Al-Wadi Al-Gadid, and Qena. – Holding presidential elections on 30 June 2012 while parliamentary elections will stay on schedule. – Allowing freedom of protest and sit-ins. – An immediate release of the detainees arrested since last Saturday. – Forming a new “national salvation” unity government. – The SCAF has no problem in having a referendum on whether the Army should return to their baracks or not. Al-Jazeera has pretty much the same story, also from the Al-Wasat party. (Al-Wasat is a Iiberal splinter from the Muslim Brotherhood.) I love that “has no problem,” though. You want us to leave? Hey, we’re cool with that! Do you mind if we shoot a few of you first, though, man? Just for old time’s sake. Liam’s take on this: “SCAF & Muslim Brotherhood cut a deal for new ‘technocratic’ cabinet & power transfer in June, SCAF remains in executive role.” Tantawi is apparently going to speak to the nation soon to announce this. “National salvation!” The father provides for your future. Now I have to go shopping. Some of my Egyptian friends, now in Tahrir, asked me to bring thong underwear. This entry was posted in Human Rights, Politics, Uncategorized and tagged April 6 Youth Movement, Cairo, Egypt, military, Muslim Brotherhood, revolution, SCAF, Tahrir by scottlong1980. Bookmark the permalink.